Latches and locks for cabinets and drawers in kitchens, bathrooms, and other areas that help to prevent poisonings and other injuries. Window Safety like nettings and guards are essential to help prevent serious falls from windows, balconies, etc. Use cupboards, drawers and outlets safety to keep the baby from getting inside them. Prevent poisoning by keeping household cleaners, chemicals and medicines out of reach by storing them in original containers with a resistant cap. Remove furniture with sharp edges or use soft guards. Place any kind of furniture away from the windows. Use nonskid rugs to make sure carpets are securely tacked down to prevent falls. Keep an eye out for tiny objects that your baby could choke on. Pick up coins, pins, marbles, beads, paper clips, and other small objects you find on low tables or the floor or in low drawers or cupboards. Do not carry hot liquids or food near your child and do not allow your child near stoves, heaters or other hot appliances. Dispose off old or outdated medications. Most medicines shouldn't be flushed down the toilet or poured down the drain, as they could contaminate the water supply. Check the label on the bottle: If it's safe to flush leftover medicine, it will say so on the label. Check age labels for appropriate toys. Be vigilant about choking hazards. 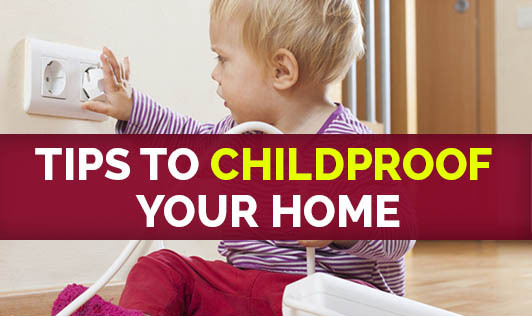 No matter how you childproof your home, teach your child what is safe to explore and what is not. This will teach them to be careful with things around them. Remember to lock the areas that are not childproofed.